The 5th generation improves on the original design across the board, adding dual mic capsules. Antlion Audio launched the ModMic 5, an upgrade to the existing ModMic 4, which we had reviewed earlier. The new version of the mic builds upon the features of the existing one with a few debatable but useful upgrades. The previous ModMic 4 was available in two variants – unidirectional and omnidirectional, and now the ModMic 5 incorporates both the type of mics in one single unit and they can be toggled with a switch near the mic. Earlier, the mute switch was also separated into two variants and this time, a detachable mute module is included with the package that can be attached between the cable and head unit. The fully modular boom mic can be attached to any pair of headphones suitable for gaming (consoles and Macs will still require the separately sold adapters), streaming and VoIP. In the package, you'll also get an extra, 2m long cable to extend the length if the default 1m length doesn't fulfill your need. The cables have been reinforced with Kevlar this time for increased durability. Priced at $69.95, the ModMic 5 is expected to start shipping soon. Fully modular boom mic that attaches to any pair of headphones! Portland, OR (DEC 6) - Antlion Audio is proud to announce the ModMic 5 is now available on their website and will soon be available in retail stores worldwide. The ModMic is an award winning attachable boom mic that can turn any pair of headphones into a headset for gaming, streaming, or VoIP and more. The patented base clasp securely adheres to any surface and the super strong neodymium magnets holds the mic in place. The 5th generation improves on the original design across the board, adding dual mic capsules, a fully modular cable system, and premium grade materials to deliver the pinnacle of custom audio. One of the most significant innovations in the ModMic 5 is the addition of a dual capsule microphone. With the flick of a switch the ModMic 5 goes from studio quality to noise canceling mode through the innovative dual capsule system built into the mic boom. This means that a single ModMic can go from a quiet home environment where quality is needed for recording or streaming to a noisy office or LAN gaming event where noise cancellation is essential. With the compact carrying case included, bringing along high quality sound has never been easier. The most common feature request by customers has come to life as well in the form of a fully modular cable system. This allows users to select the right cable length for their needs and quickly swap over to different devices, such as PC, current-gen consoles, or smart phones. Included with the modular cables is a detachable mute switch module and the new cable wrap system, which ensures perfect cable management, keeping the cords from the headphones and the ModMic tightly bound together. Finally, the materials in the ModMic have been improved across the board. From Kevlar reinforced cabling to a thicker steel spine and a stronger magnet, there’s never been a better ModMic than the ModMic 5. "This is the culmination of taking years of feedback from our users and putting every reasonable improvement suggestion into action," said Elishaya Wisnievitz, CEO of Antlion Audio. "We have never been more proud of and thankful to our many fans, and we believe the ModMic 5 will show our commitment to listening and acting on their feedback." Antlion believes all people should have the option to use the headphones they love and still enjoy the superb quality that a ModMic can bring. 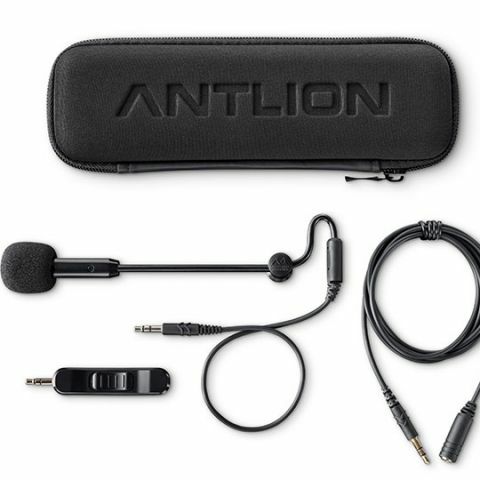 Find out more at the ModMic website at www.AntlionAudio.com.